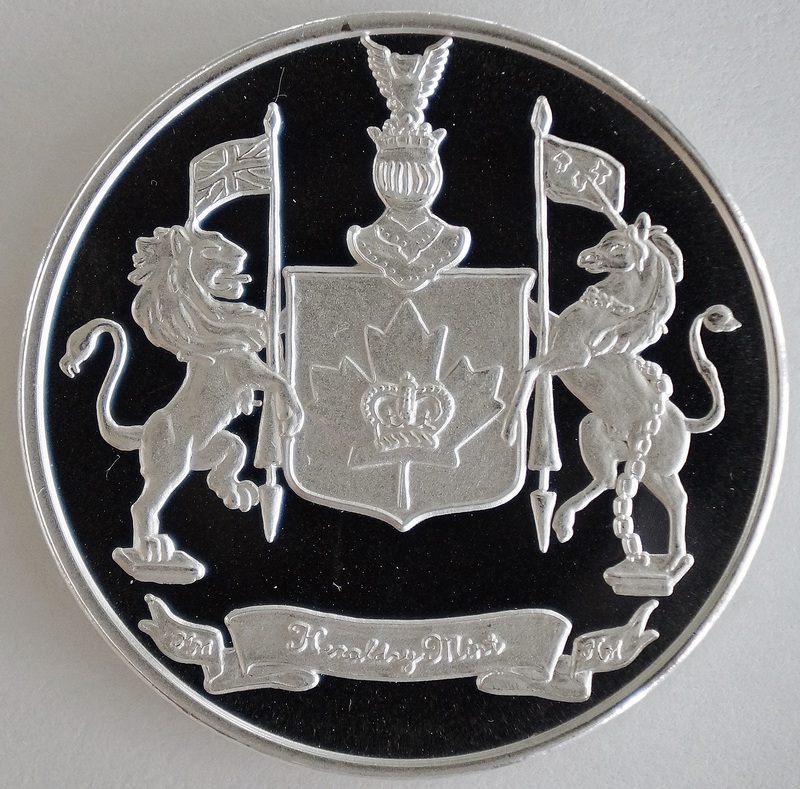 Each of this HWMC Heraldry Mint 1 oz Silver round features Canada Heraldry design! We provide all our customers with a refund, return and/or exchange policy on everything we sell. If for any reason you have a problem, please feel free to call our offices. We will always do our best to accommodate you. 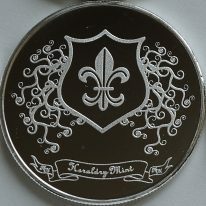 Heraldry Mint “Canada”, 1 ounce Silver Round, most elegant workmanship, mirror-proof like, 20 or more comes with sealed tube. 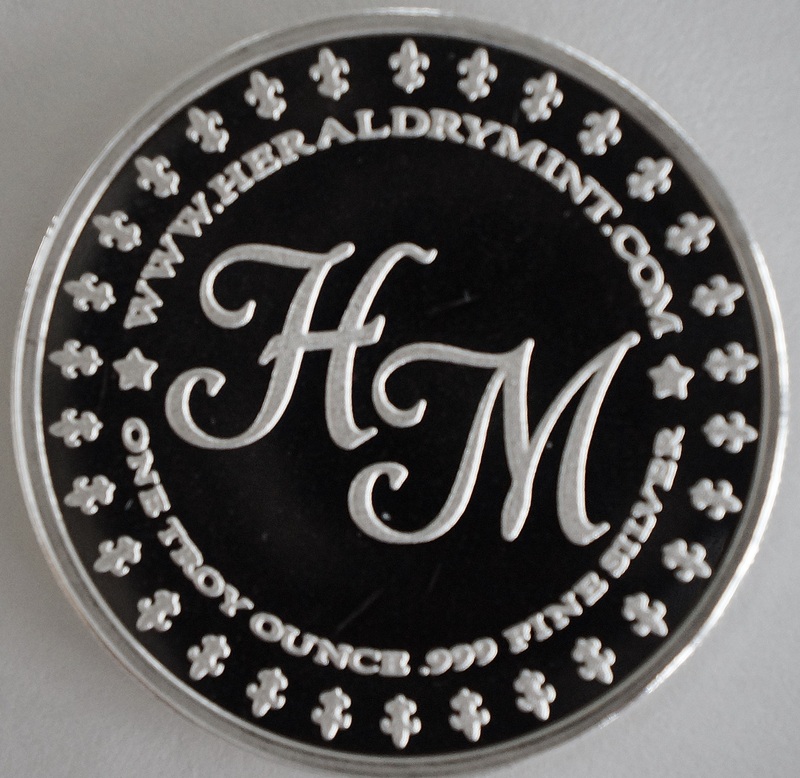 HWMC exclusively mints for the striking of Heraldry Mint silver rounds and consistently offers .999 pure or better grade silver and individually hallmarked and stamped with its weight and purity. 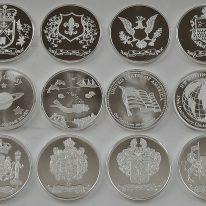 These 1 oz fine “Canada” Heraldry theme silver rounds allow investors to hold a high-end silver investment but also a work of art that can be enjoyed. Heraldry is the profession and study of granting, devising and blazoning arms. Strictly speaking the word ‘heraldry’ comes from Anglo-Norman and refers to all matters considering the duties and responsibilities of officers of arms. However, the focal point of heraldry is based on the practice of displaying, describing, designing and recording coats of arms as well as heraldic badges. English heraldry belongs to Gallo-British heraldry which also includes Irish, Scottish, Welsh, Canadian and French heraldry. In the United Kingdom, royal officers of arms are in control of English heraldry even today. The Royal College of Arms grants and regulates coats of arms in England and is one of the few still existing official European heraldic institutions. The English heraldic style is notable for its connections to royalty as well as the civic arms of cities and noble arms of individuals. Moreover, royal orders retain their coats of arms. Heraldry has become a flourishing style of art within today’s modern world. Fact is that nowadays many institutions, companies as well as a series of private persons use coats of arms as their pictorial and individual identification. So the profession and study of granting, devising and blazoning arms and coats of arms is still predominant and ruling many companies’ everyday life. Heraldic societies emerge all over the world – in Africa, the Americas (North America as well as South America and Central America), Asia, Europe and Australasia. Strictly speaking most heraldic societies are characterized through so-called heraldry aficionados. 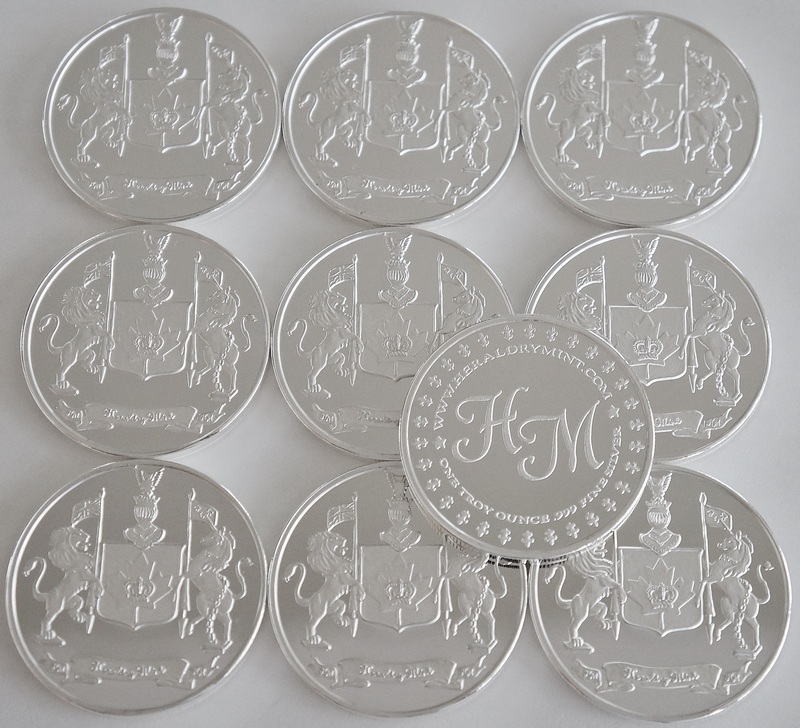 As we deeply learned the studies and the art of Heraldry, we first designed four new .999 Fine Silver Rounds which are England, France, The Americas and Ireland. 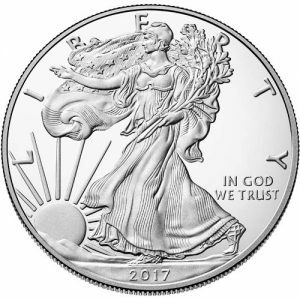 All these silver rounds are consistently offer .999 pure or better grades silver and individually hallmarked stamped with its weight and purity. 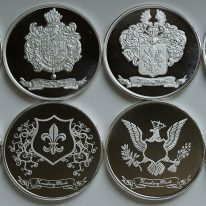 We now also included another 4 new Countries and they are Germany, Spain, Italy and Canada to complete our Heraldry Study and our coin set of eight silver rounds. HWMC stands behind every product it sells with a satisfaction guarantee. I am extremely satisfied with my purchases and professionalism of your staff and company. I have dealt with a few others and you folks have my business from now on. 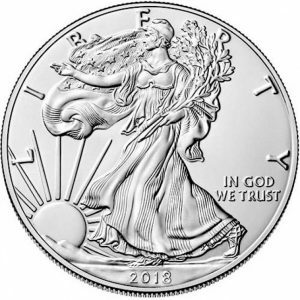 You are now my one and only source I will use for precious metal products, thanks again for fast shipping and very nice products, very appreciated. 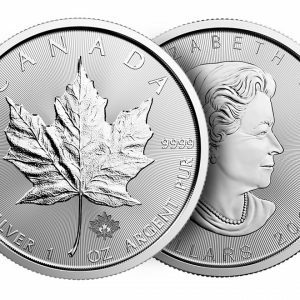 I lived in Quebec Canada at my younger age and still missed that time, when I see this silver coin, can’t wait to purchase to bring back my best memory, thank you HWMC to carry it and made such beautiful design, couldn’t wait to get more, Happy New Year!